Well, its the 1st April already, and that means its time for the new Stampin' Up! Mini Catalogue!!! Stampin' Up! 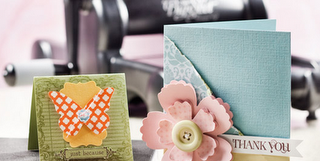 has teamed up with Sizzix to offer you the ultimate multipurpose cutting system youve been waiting for! With the Big Shot and Stampin' Up! dies, you can create die cut shapes from paper, fabric, chipboard, and more. Also, emobiss fabulous designs with the Big Shot and a variety of embossing dies and folders. Instant, ideal accents for cards, scrapbook pages - anythin!! If you would like a copy of the new catalogue, please contact me either by email at cavaliercrafts@gmail.com or call me on 07703 171 600. There is also a link on the right hand side of my blog (for those who cant wait lol). Yesterday I received my first order from Stampin' Up!, so I have lots of goodies to play with. My first project is going to be some Mother's Day cards for Sunday. I also have a First Bday Card to make and a Gift Card Holder for my Brother In Law. I will take photos once they are finished so that you can have a look.